Hanesbrands Inc. HBI released fourth-quarter 2018 results, wherein the top and bottom lines exceeded estimates. The company had posted in-line earnings in the third quarter. Sales beat estimates after missing the same in two consecutive quarters. As a result, shares of the company increased 6.6% during the pre-market trading session. 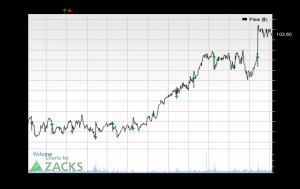 Crocs, Inc. CROX has long-term earnings per share growth rate of 15% and a Zacks Rank #1 (Strong Buy). You can see the complete list of today’s Zacks #1 Rank stocks here. Columbia Sportswear Company COLM has long-term earnings per share growth rate of 10.9% and a Zacks Rank #1. Ralph Lauren Corporation RL has long-term earnings per share growth rate of 10.2% and a Zacks Rank #2 (Buy).